This dissertation studies the phenomenon of exclamativity . It suggests a formal definition of the exclamative speech act based on a discourse perspective . In the literature wh - exclamative sentences , such as " What a delicious dessert John baked ! " , are mostly studied from a semantic perspective . Various semantic theories of wh - exclamatives have been suggested , focussing on the denotation of this type of sentences . What is often left outside of consideration is how uttering such a sentence affects the conversation . 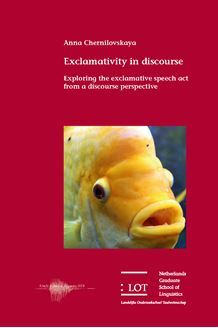 The context - change effect of wh - exclamatives is sometimes associated with the notion of " exclaiming " , which has not been formally defined in the literature . This dissertation sets out to define the exclamative speech act from a discourse perspective , on the basis of a case study of wh - exclamatives . The central assumption here is that studying the discourse behaviour of such sentences provides useful information for defining the exclamative speech act . The discourse properties of wh - exclamative sentences are thoroughly investigated based on naturally occurring examples from the Corpus of Contemporary American English ( COCA ) . Subsequently , the exclamative speech act operator is defined in a model of context . This study thus provides an answer to the question what the context - change effect of uttering a wh - exclamative sentence is . The discourse perspective taken in this dissertation suggests new directions for analysing various speech acts . This study is of interest to researchers working on expressivity and speech acts , as well as those concerned with semantics , formal pragmatics , dialogue , and corpus research .